Menuvative has pioneered the movement to paperless tablet menus since 2012. Today we proudly serve every type of restaurant concept across the US and beyond. When to go paperless is a big decision for any restaurateur. With our experience and track record of success, you can trust the transition will be a positive experience for your staff, your guests, and your bottom line! Menuvative pioneered the concept of tablet menus nearly 10 years ago. Founded by restaurant veterans, we know more about menu engineering and the guest experience than anyone in the business! One look at Menuvative’s features and you’ll quickly realize nothing else even comes close. What makes a great tablet menu? To answer that, you must understand the restaurant business. You must understand the guest experience. You must understand sales and marketing. And you must know what makes a BAD tablet menu. You’re in the middle of reading a digital ad or menu and it suddenly flips to the next page. Annoying, right? Imagine having digital signage that can flip through ads when people are walking by, but if an observer touches the screen, he/she can slide through the ads with a finger and even interact with popup layers built into your ads. 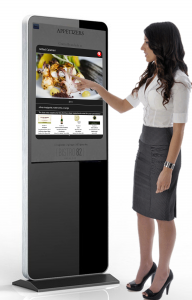 You could create interactive menus with integrated marketing for your restaurant entrance or hotel lobby. THIS IS NOW AN AFFORDABLE REALITY! Imenutech offers digital signage displays from 22″ to 65″, floor standing or wall mounted, indoor or outdoor, with and without touch controls, and with Android or PC interfaces. And if you use Menuvative as your content management solution, you can manage as many devices as you want from your cloud based dashboard.